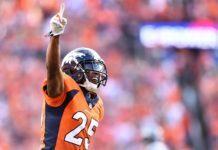 The Denver Broncos and Oakland Raiders square off Sunday in a match up of divisional foes as Denver looks to improve to 2-0 while Oakland hopes to avoid an 0-2 start. But who has the advantage Sunday in the great, long-standing rivalry? Let’s break it down by piece by piece. The Denver Broncos’ offense showed versatility, explosiveness and creativity in Week 1 against Seattle. Offensive coordinator Bill Musgrave crafted a brilliant game plan that utilized undrafted rookie Phillip Lindsay enough, but not too much. 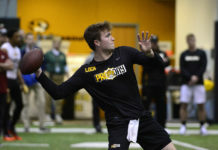 Musgrave’s offense sported several different, complex sets, but they were still simple enough to execute and the team played fast. 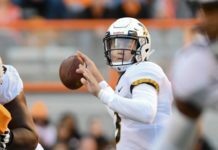 The Broncos scored 27 points in Week 1, something they achieved only once in the entire 2017 season. Oakland’s defense was stout in the first half against the Rams, holding what many believe will be an explosive offense 10 points, but they buckled in the second half after adjustments were made. While Oakland’s offensive coordinator is Greg Olson — who is quickly rising up the NFL ranks from his previous successful coaching stints with Carr, Blake Bortles and Jared Goff — he’s more of a glorified quarterbacks coach, while Gruden calls the plays on offense. Denver managed to hang 27 points on the Seahawks’ defense while still throwing three interceptions in the game and their offensive line was a big part of that success. Matt Paradis scored the highest mark for Pro Football Focus when it comes to centers for Week 1. While most don’t expect Denver’s offense to continue to put up big numbers, the same can be said for those turnovers, too. Denver’s run game also was effective thanks to the offensive line, who notched the second-best run blocking grade in the league in Week 1. Bronco to watch: Courtland Sutton. Avoiding the obvious answers, watch out for Courtland Sutton against Oakland. Gareon Conley is likely the man to match up against Sutton, who will have a four-inch and 15-pound advantage in size. With Oakland’s hands tied trying to handle Emmanuel Sanders and Demaryius Thomas, Sutton will have opportunities to flourish and break out on Sunday against lesser competition at corner. Derek Carr looked tense and anxious on Monday night, even in clean pockets, including two occasions where he looked to throw the football away despite facing no pressure – one of those resulted in an interception. It was just one of three picks for Carr, who produced one of his worst days as a pro. The road doesn’t get easier for Carr as Denver’s defense – which sacked Russell Wilson six times – plays host to Oakland, who is on a short week. However, Carr has found success against Denver in the past. While Carr only completes 59% of his passes in his career against Denver, he has thrown for nine touchdowns against only four interceptions against his division rival. But Carr won’t beat Denver singlehandledly. If the Raiders are to have success on offense, it’ll be running the football. Marshawn Lynch, last seen dragging defenders into the end zone, still looks in prime shape at the age of 32. That said, Lynch has been bottled up by Denver in his career. Against the Broncos in five games, Lynch has averaged 3.2 yards per attempt, which is the fourth-lowest average for Lynch against an individual team. Scared of #Beastmode? Consider this. #Denver has contained Marshawn Lynch in his career very well. Lynch's 3.2 YPC avg against the #Broncos is the 4th lowest for ML against individual teams. Only the #Steelers, #Oakland (his current team) & #Chicago have a lower allowed YPC avg. If Oakland can’t get Lynch going, their offense becomes too one-dimensional, leaning towards Denver’s strength, the pass rush. 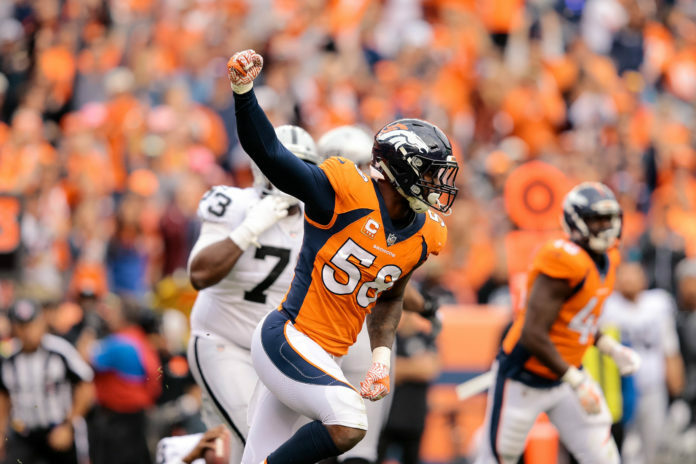 If Denver gets out to a quick lead and allows for Joe Woods to unleash linebackers Von Miller and Bradley Chubb (3.5 sacks combined in Week 1,) Denver’s game-long harassment of Carr will prove too much for Oakland to handle. Becoming one of the more vocal leaders for the Broncos’ defense, Simmons intercepted a pass against Seattle and looks to be developing into a fine secondary piece for defensive coordinator Woods. There may be more opportunities for Simmons this week as the pass rush gets to Oakland, but it may be more important to keep an eye on Raiders tight end Jared Cook, who ran wild for nine receptions and 180 yards Monday night for Oakland. The Denver Broncos may own the most improved special teams unit in the NFL. Brandon McManus made Pro Football Focus’s team of the week for his 5-for-5 day kicking extra points and field goals, including hitting from 53 yards with ease. Punter Marquette King pinned the Seahawks back inside their 20 three times. His average return yardage of 3.7 ranked inside the top ten in the NFL for Week 1. Fumble-prone returner Isaiah McKenzie was cut and replaced by sure-handed Adam Jones. Meanwhile, Oakland’s special teams were fairly quiet on Monday night. Kicker Mike Nugent went 2-for-2 in field goals, including a long of 48 yards, and made his one and only extra point Monday night. Neither team has a major edge, but consider this the X-factor: King was shunned from the Raiders after new coach Jon Gruden took over, with a failure to communicate that ultimately led to his release, and subsequent signing, with Denver. King didn’t acknowledge Gruden when asked about him, shunning him completely. It's personal, and it could be that internal fire that is a difference maker this Sunday. When it’s personal, internal motivation you can’t teach comes out. It could be a difference-maker on Sunday. Two of the more questionable coaching situations in the league will face each other Sunday. Vance Joseph has been coaching for his job what seems like out of the gate since the NFL draft concluded in April, while the honeymoon period with Gruden and the Raiders seems quickly over after cutting King and trading away elite pass-rusher Khalil Mack. Denver owns a major X-factor in this category in Bill Musgrave, not only because he crafted an excellent game plan Sunday against the Seahawks, but because Raiders quarterback Derek Carr has never been better than when he was with Musgrave as his former offensive coordinator in Oakland. If anyone knows Carr’s tendencies, preferences and dislikes when it comes to facing a defense, it’s Musgrave. Sharing that info with the defense is valuable information for Denver as they look to improve to 2-0 on the season in-front of the home crowd.